Let me preface this article by saying I highly recommend getting the 3 day pass to Fuji Rock in order to get the full experience. As someone who has gone up for a single day and night in the past, I feel that in order to grasp the essence of Fuji Rock, what makes it different from your average festival, is to take in the festival experience as a whole and not just bits and pieces. Secondly, I made this article a list as people generally like lists and it should be easy to read. Keep in mind, it’s not a ranked top 10 list, but just my list of 10 tips. If after reading it, you feel I’m missing something crucial for newcomers to Fuji Rock let myself and the readers know. With that said, let’s get to it. This ties in with my previous statement of taking in the full Fuji Rock experience. The pre-party on Thursday is great fun. It features surprise bands, fireworks, a bon-odori dance and more. Arriving Thursday will also give you ample time to set your tent up and get a decent spot (e.g., not sideways halfway up the mountain). You’ll also be in great shape to get an early start on Friday when the festival officially kicks off. 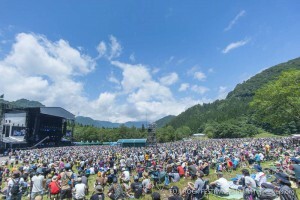 Fuji Rock Festival is such an expansive festival, with an overly wide range of acts and musical styles. Tickets aren’t cheap, so you owe it to yourself to do a bit of research and planning coming in. If you’re like me, as soon as the schedule is released, you’ll face the incredible challenge of deciding which band to see and when, planning your daily schedule. I highly recommend putting in a bit of work before the fest, it will pay off greatly knowing who you want to see throughout the day instead of wandering aimlessly. That said, part of the fun of such an expansive festival is being surprised and discovering something new. So, definitely make a plan but don’t get too worried if you stray from it a bit. So now that you have your daily schedule figured out, it’s essential that you know your surroundings if you plan to keep on schedule. Part of the good thing about coming early on Thursday or Friday is that the grounds are a lot less busy than on the weekend. You’ll have space to get to know Naeba and time how long it takes to get from one stage to the next. Do keep in mind you’ll need to give yourself extra time on Saturday and Sunday when the festival is at its peak and the hordes of people are moving at a crawl from one stage to the next. You did know FRF takes place at a ski resort, right? You’re going to be partying in the mountains for the three days so don’t miss out on actually partying on the mountain. The dragon themed gondola to the top of Naeba delivers great views of the whole area and drops you off at a chill spot to relax or dance it up on the top of the mountain. Another frequently missed area by first timers is the Cafe de Paris at the far end of the grounds. A lot of work is put into the venue, the entertainment and the acts here, so do yourself a favour and check it out. It’s the only stage where you can chill out at a table with friends, order up a cocktail (I recommend their mojito) and take in some great live music (usually in the jazz/funk/world music variety). This might be the most important of all my tips if these were ranked. The past few years the weather at Naeba has been relatively pleasant and rain free, but FRF has been known to be notoriously rainy. You don’t want to be sopping wet and shivering when there’s loads of live music going off. Similarly, you don’t want to be sweaty and uncomfortable bundled up in a jacket and knee high rain boots when its 30 degrees and sunny. So plan accordingly; it’s worth the extra baggage space for rain boots, a jacket, sunblock, and a hat if it means you’re going to be prepared for whatever the Naeba weather brings this year. If you’re planning on coming for the entirety of the festival, (which you should be) you’re going to need a break or two (if you don’t want to end up passed out on the side of the mountain early Monday morning that is). As you’re running from stage to stage throughout the day, maybe take an hour out of your schedule for a nap or a chance just to chill at your campsite for a bit. This is particularly helpful if there’s bands or DJs you want to watch that are slotted in the late night/early morning timeslots of the Red Marque or the Crystal Palace. There’s usually high energy DJs and bands booked to these slots, and while coffee, an energy drink or alcohol might get you through in the short run, there’s no substitute for being well rested. Speaking of late nights, you’re going to want to spend some time in the Palace of Wonder area near the entrance to the festival. This area is open nightly from 11pm to around 5am. There really is something special about this area that you don’t fully start to understand until you’ve been to a few Fuji Rocks and spent some time here. You don’t need a festival pass to enter the Palace of Wonder area which means the area gets its share of colorful visitors; from locals in the Naeba area, to people who almost exclusively party in the Palace, to the loads of people who work in the Palace, there is always a great vibe to this place. There are carnival like attractions here, circus sideshows, hidden bars and two stages of music. The Rookie A Go-Go stage is here featuring rookie bands of all talent levels looking to make their mark. The Crystal Palace Tent stage also in this area always features an eclectic mix of quality DJs. Similarly, the bands (often fairly big-name bands) booked to this small stage have been known to deliver some of the most intimate, emotional, high energy sets of the entire festival. It’s the unexpected surprises both musically and otherwise that make the Palace an essential visit for Fuji Rock newcomers and veterans alike. If like most people, you enjoy a little alcohol to enhance your festival experience, I highly recommend you to bring your own. While glass is prohibited at the fest, anything else goes. If you’re looking to save money, avoids long lineups or are just more comfortable drinking your own cocktails, this tip is really a no-brainer. There’s loads of options on how to do this. Remember, it may be tough to keep drinks cold beyond the first day in your cooler, so don’t bank on ice cold drinks and you should be good. If you need to restock your supply, there’s a few stores selling drinks, snacks and alcohol within walking distance of the fest. “Life moves pretty fast. If you don’t stop and look around once in a while, you could miss it. ” This last tip via the classic 1986 flick, Ferris Bueller’s Day Off, isn’t something that applies solely to Fuji Rock but can and should be applied to life. So, while this festival is filled with great live music almost non stop for 3 days straight, it’s not the music that makes Fuji Rock special, it’s the little things. What separates Fuji from the rest is when you slow down; make a new friend, enjoy the camping experience, take a gondola ride, eat some great local food or discover a new band. Go out of your way to slow down sometimes at Fuji Rock and you will be surprised at what you find.